Lots of fashion news these days... The designer who brought you the famous Balenciaga motorcycle-inspired handbags has parted ways with French conglomerate PPR owned by Mr. François-Henri Pinault. Nicolas Ghesquière, has been with Balenciaga forever. He started at Balenciaga doing the licensing and designing for the Asian market. Pretty soon, after Balenciaga firing of his predecessor, Josephus Thimister, he became its creative director in 1997. The brand took off and Balenciaga became a critically acclaimed fashion house under Nicolas. In 2001, he won Womenswear Designer of the Year by the CFDA. In the same year, The PPR bought Balenciaga. It was a happy marriage until.. the rumor has it..... Bernard Arnault, owner of LVMH Moët Hennessy Louis Vuitton, the archrival of PPR, is poaching (or in this case, perhaps poached already) Nicholas. Mr. Ghesquière has been offered a house under his own name. Now what fashion designer wouldn't want a label of his/her own? When he designed for Balenciaga, he had to always reference back to the brand's haydays of 1950s. Now, he can do whatever he wants. I can't wait to see what he comes up with. In the mean time, SS 2013 is his last season at Balenciaga.... you might want to stock up if you jive with his designs. I really like Ghesquière's style. His clothes are very avant-garde without being unwearable. 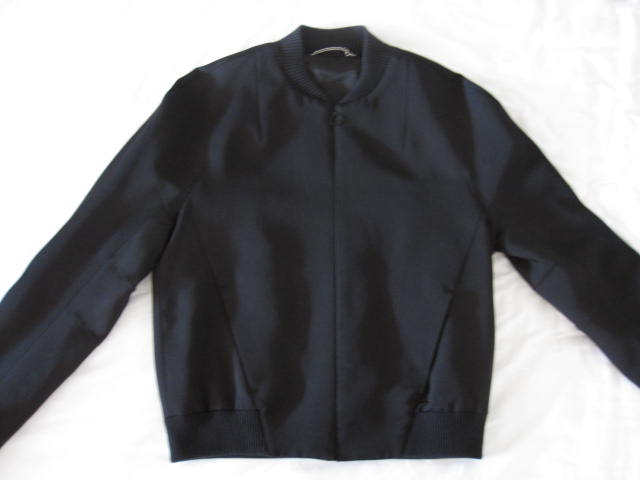 This black jacket at first glance looks like a typical clean cut jacket. However, upon close examination, there is actually no arm seams as a typical jacket would have. The details are all very subtle. I think it's a good medium between very commercial brands like Michael Kors and super avant-garde clothes that Lady Gaga would wear to events. The news now is that Alexander Wang will head the house of Balenciaga. It's very exciting and I think it could be a good fit. We actually went to the same school (not the same year though): Harker School.